Good News, Jio users you can save more on your recharges now. 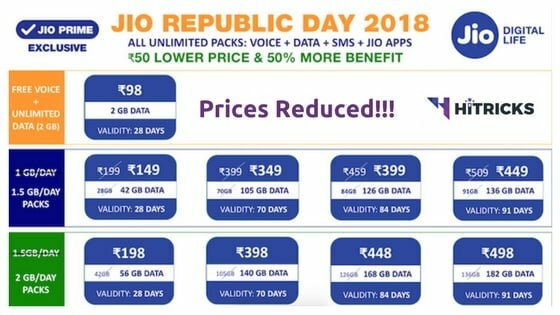 Jio has introduced their new Happy Republic Day 2018 Offer under which they have reduced their prices further and added more data bundles. These plans can be purchased from 26th January 2018 onwards and will be available to buy from MyJio App, Jio.com website or even 3rd party recharge websites like PayTM, Freecharge etc. For your information, Jio has already started a lot of 3rd party offers under their Jio Happy New Year 2018 Offer. They are valid even with this Republic Day offer schemes. We will talk about them too. And, that’s not all, if you are using a JioPhone, Jio has further discounted plans exclusively for JioPhone users that will offer better benefits. Check out all the latest offers below. Jio has revised the old plans further adding more benefits. The Happy New Year Plans which had 1GB Data per day are now increased to 1.5GB Per Day. Yes, that’s 50% extra data every day to use. Isn’t it awesome? So, these are the 1GB/Day plans which got upgraded to 1.5GB per Day. YOU MAY ALSO LIKE: How to Link Aadhar Card with Mobile Number Offline from Home? But in case you are a heavy user and need much more Data every day, then Jio got you covered too. The Existing 2GB Per Day Plans now got Upgraded to 3GB Per Day, and the 3GB Per Day ones to 4GB Per Day now. That’s Wow! This Rs799 Plan is a new plan introduced by Jio for the Heavy Data Suckers. But don’t think this is costly at all. Remember a few years ago we used to get 5GB or 6GB Vodafone 3G or 4G at Rs800 or Rs900? This is 140GB! So, you can’t complain about it. So these are all discounted plans that you can avail right now. There are also some small plans tailored for some specific users if anyone needs. Jio Rs19 Plan: 1 Day Validity, 0.15GB Data, Unlimited Calls, 20 SMS, Unlimited Jio Apps Subscription. Jio Rs52 Plan: 7 Days Validity, 1.05GB Data, Unlimited Calls, 70 SMS, Unlimited Jio Apps Subscription. Jio Rs98 Plan: 28 Days Validity, 2GB Data, Unlimited Calls, 300 SMS, Unlimited Jio Apps Subscription. Confused about which plan to recharge? Don’t be. Like every time, this time too, I am here to analyze those above plans and simplify them for you. I am coming to that later, before that, let’s discuss the JioPhone Plans below. YOU MAY ALSO LIKE: JioTunes: How to Activate FREE CallerTunes Service for Jio Users? JioPhones are special cheap mobile handsets with an effective price of Rs0 (yes, zero only), as you get to return your device and get a full refund. Those who have grabbed their JioPhones can now avail some exclusive cheap plans from Jio. Like all other benefits, these are also available for Jio Prime Users only. All Plans include Unlimited Incoming and Outgoing Local and STD Calls. They include Unlimited Roaming too. 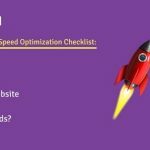 Post Consumption of High Speed Data, you can browse the Internet at 64Kbps, for the rest of the Day. Unlimited SMS is actually 100SMS/Day, as permitted by TRAI. Jio Republic Day Plan: Which one is Best? So, you must be thinking which plans to recharge? I will directly ask you this, What is your Internet Consumption requirement? That will determine your ultimate consumption. Check out the 1.5GB/Day plans. Rs149 Plan, 28 Days = Rs5.32 per day. Rs349 Plan, 70 Days = Rs4.98 per day. Rs399 Plan, 84 Days = Rs4.75 per day. Rs449 Plan, 91 Days = Rs4.93 per day. So, if we compare them, then the Rs399 plan for 84 Days is the best Value for Money Plan out there. Go for it if you want to save the most amount of money. If you need 2GB/Day, then calculate the cost per day. Rs198 Plan, 28 Days = Rs7.07 per day. Rs398 Plan, 70 Days = Rs5.68 per day. Rs498 Plan, 91 Days = Rs5.47 per day. So, here again, we see that the 84 Day Validity plan of Rs448 is the best Value for Money Plan. So, if you think long validity plans are always beneficial, you might get wrong. But, well, the difference of money per day doesn’t make a huge difference. I personally prefer getting full 3 months protection, so I always opt for 91 days plan, even though it costs a bit more. For all average users, they prefer the Best Value for Money Plans out there. If you want to pay the minimum amount and enjoy the maximum benefits, then Rs399 or Rs448 Plan is best for you, depending on how much Internet do you want per day. If you need 3GB / 4GB / 5GB per day then you don’t have much of a choice out there. You need to opt for the available plans for them. Learn What will Happen to your Jio Sim if you don’t recharge your Number. If you own a JioPhone, then opt for Rs49 plan or Rs153 plan based on your requirement. Rs49 Plan: If your main purpose is just calling, and you need very small Internet usage, maybe for updating something or Googling quickly. You still get 1GB of the Internet, with which you can fully use Social Networking for the whole month. Rs153 Plan: This is for those who need Internet usage more. If you consume Jio Apps then you might need this plan. You are getting 1.5GB Internet every day which is pretty much a lot. You will find it hard to consume even 75% of the allotted data. PayTM: New Users use Promo Code: NEWJIO and Get Rs50 Cashback. Old Users use Promo Code: PAYTMJIO to get Rs30 Cashback. Additionally, users will get 50% Cashback on first-time movie booking. Mobikwik: Both new and old users can avail Rs300 Mobikwik Supercash by using the Promo Code: JIOGIFT. Additionally, users will get 100% Mobikwik Supercash Hotel Voucher upto Rs2500. PhonePe: New users get Rs75 Cashback, Old users get Rs30 Cashback on recharging via PhonePe. Bhim UPI: New users get Rs100 Cashback, and Old users get Rs30 Cashback on recharging via Bhim UPI. Freecharge: Both New Users and Old Users use Promo Code: JIO30 and get Rs30 Cashback. Use any of the above platforms to recharge your Jio Number and get Surprise Cashback benefits on different sites and apps. The benefits are listed below. Jio Vouchers: Get Rs400 worth Jio Voucher over the course of your next 8 Jio Recharges, Rs50 each time. So, from the next time, you will be able to get Rs50 off on your next Jio Recharges for 8 times. It is a long-term benefit, but worthier than getting no benefits at all. Zoomcar: 20% off on your Ride up to Rs1000. Oyo: 30% Discount on Oyo Rooms Booking and 50% Oyo Money Cashback upto Rs1500. PayTM Mall: Rs2000 Cashback on Purchase of Rs10000 or more worth Electronics. BigBasket: 20% off on a purchase of Rs600. Grofers: Rs300 Cashback on orders of Rs1500 or more. Yatra: Rs500 off on one-way flights and Rs1000 off on Round Trip flights. These partner offers are valid until 31st March 2018. Use your coupons before they expire. 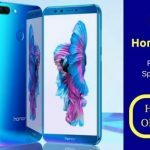 Well, that’s all about Jio Republic Day Offers 2018. I hope you will be able to avail the best discounts while recharging your Jio Number. If you have further queries, do comment below, I will be happy to help you out. Thanks for reading this article. Don’t forget to share this offer with your friends and help them out. Use the social share buttons below. Well, signing off for now. I will be back soon with another interesting update. Till then, stay tuned!